RIPLEY — A historic site in the Copper Country is getting recognized for its significance in the history of metallurgy. The Quincy Smelter Works was built in the late 1800’s and was a key component of the copper mining industry. During a time when copper from the Keweenaw was wiring the nation’s sprawling communications network, much of the raw material went through here. 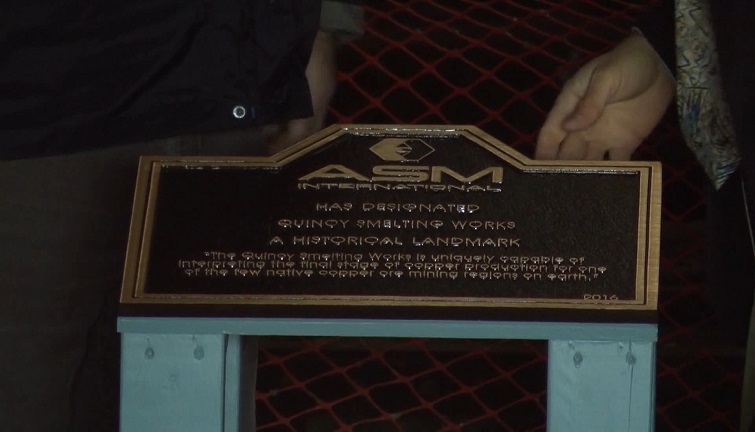 ASM International presented the smelter with a Historical Landmark Award, which helps bring awareness to the metallurgical process that took place on the site. So why did it take so long for the site to receive the award? “That’s a great question! I grew up here, that was some 60-odd years ago, and coming back and forth across on the roads, going right past here, I often wondered why isn’t this more of a big deal, because of so much history happening here,” said Dr. Iver Anderson, Senior Metallurgist, Ames Laboratory. The smelter closed in 1972 is largely preserved from its original operations. It’s the 141st location to be named a Historical Landmark by ASM International. First Blast of Winter in Central U.P.